The road to Afton State Park is dark, curving and twisting through the dawn like a thin grey ribbon. All is still, silent and peaceful, the sleepy farm buildings waiting for the day to begin. Like so many that morning, I was headed there early to prepare for big adventures ahead. Every once in a while another set of headlights would appear, and I knew, instinctively, that they were going to Afton. 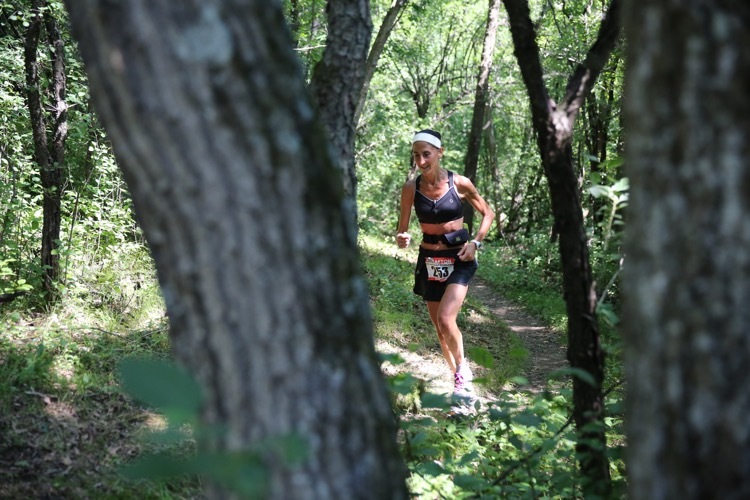 Sandwiched in between 4th of July festivities, the Afton Trail Run 25k/50k draws a celebratory crowd, and has a loose, joyful, rock festival vibe that suits the season. Patriotic themes and stars-and-stripes running wear abound; watermelon slices and picnic food are everywhere. Friends reconnect, families come in groups, inquisitive dogs find shade under tent poles and watch for rabbits in the brush. Like a vintage band, even after 25 years, Afton continues to thrill the spirit with both rich memories and new twists. And yet, the climbs are there, and they are real. The race rewards the strong, the patient and the tactical. From wide grassy savannas to shaded rolling singletrack to the hands-on-the-knees meatgrinder ascent, the course is a treasure trove of challenges. For the 50k competitors, doing it twice means one must be balanced on each section, letting out the lines just enough without using up all the fire. In no time, the 50k runners were off and it was time for me to head over to the spirited, patriotic aid station run by the Trail Runners of Elm Creek (aka TRECS). If you’ve run this race, you know this place, which combines assembly-line aid station perfection, unending amounts of enthusiastic cowbell, a dancing dinosaur, and what looks like the exploded insides of the 4th of July section at the Dollar Store. But Joe Lang, the aid station captain, has a purpose behind all the enthusiasm. Every runner who comes through is made to feel special, to feel welcome, to feel unending confidence that he or she will finish with pride and buoyant joy. A new campground trail was built by consummate ultra veteran Donny Clark and a whole team of fellow trail masters. This 25th anniversary Afton was its inaugural run and it did not disappoint. 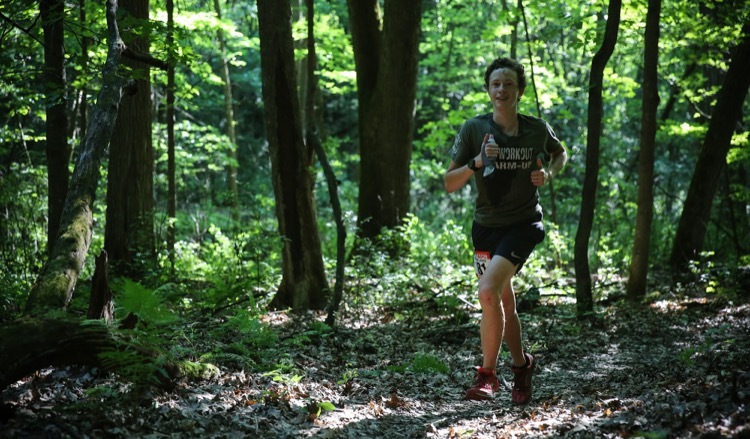 More than one runner wind-milled down into the aid station like a new skier bombing down a Black Diamond slope. Even the leaders could not resist the happiness that comes from pure speed. As I raced to fill their water bottles, they were laser-focused, but undeniably happy. “It’s amazing!” they said, referring to the hill, the beautiful day, and, probably, the unnamable joy of asking one’s body to fly and feeling it respond. The records were falling as the leaders crossed the line…the unflappable Benjamin Cogger, dancing through the forest like a mythical woodland sprite, and the awe-inspiring Eve Rembleski, looking like a subject of a pre-Raphaelite painting as she floated across the finish line to the enthusiastic cheers of her family. The shadows lengthened, and the runners streamed in. We worked tirelessly, and although my heart hurt a little when I checked my watch and thought of where I would be on the trail if I were running, I gradually became more and more fascinated with the runners’ courage and tenacity. “We’re going to do this,” they all announced cheerfully, grabbing some M & Ms and getting a beloved cold sponge to the neck from aspiring Grand Slammer Mark Smith. 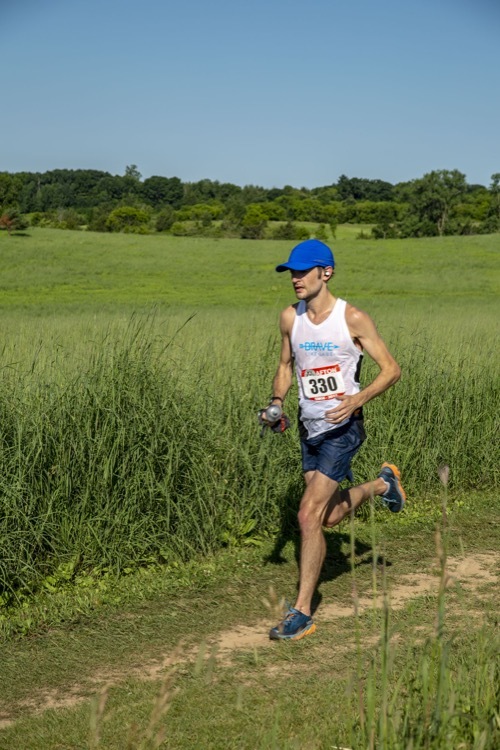 As I filled my 10th pitcher of water, I admitted that this unquenchable optimism and tireless curiosity among trail runners is what keeps me coming back to these races. It is what sends us all over the mountain, into the dark of the soul, through rivers of mud and gates of fire. It is what lifts us up off our knees and drags us into the light of possibility, triumph and surprise. For a quarter of a century, Afton has opened the door to these new adventures, for those ready to shut their eyes, throw off the chains of comfort and familiarity, and take the journey. Next Article What’s in Jax Mariash’s Stage Racing Pack?